The Beatles had a song about working "Eight Days a Week" -- and it has felt like it. It's been seven days to keep up with work and administrative stuff. Calls keep coming in from all over. We are an example of a green company that is thriving in an economy when the "non-greens" aren't. It's also an example of doing the right thing at the right time. I did take time to take this sunrise shot this morning...Got to run. Taiwan's President Ma Ying-jeou told a news conference that climate change was a bigger threat to its future than mainland China. Think about that statement for a second. Taiwan's President spoke after Typhoon (which we call a Hurricane) Morakot killed as many as 500 people. Taiwan's military will now be focused on being a first responder instead of focused on China. Think about it. Climate change and stronger hurricanes/Typhoons caused by planetary warming is a bigger threat to the leadership of place like Taiwan than than a war! It was reported today that water temps were as high as 86 degrees near the U.S. Hot water like that is gasoline for hurricanes. The same applies to tornadoes. Today Colorado got huge hail stones -- which broke windows all over Austin during a hail storm a month or so ago. Weather is becoming a bigger threat than a potential nuclear exchange. Even the U.S. military has raised the alarm on how climate change increases global INsecurity - making it more dangerous as it causes food and water shortages along with more violent weather, droughts, etc. We need to take actions that will both defend from, and reduce, this threat, immediately. Unless you happen to have ready access to another planet you plan to move to when this one is no longer habitable due to climate heating on the scale of Venus? One solution that would make a difference -- white roofs. Converting roofs to white would cut enough emissions which would be the same as cutting all human emissions for a full year -- just by changing the color of our roofs. Imagine how we can advance by using smart methods to keep humans in charge of a sustainable, healthy planet -- the only one like it in light years around us. 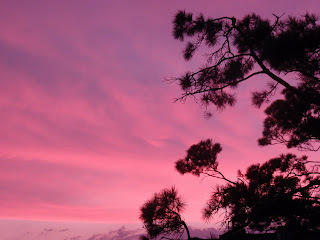 This was sunrise over Seabrook this morning. 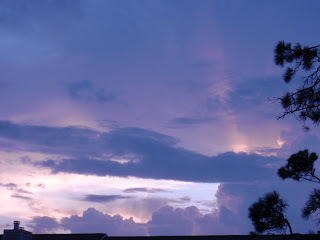 The light shaft from the sun on the right was dramatic. It appears that we are getting a pass on the first tropical storms of the season. Hurricane Bill is probably no threat to the Gulf but could be a problem on the east coast. We have at least another intense month to six weeks for more storms to pop up - even in the Gulf of Mexico like Claudette. The first time people lose power they will realize that they don't have digital TV access, etc. Experience is always the best teacher. As I was buying a Blackberry “Storm” Saturday, the Atlantic produced two Tropical Storms of its own: Ana and Bill –the first of the 09 season. Then today T.S. Claudette fired up – starting in the Gulf of Mexico just off the coast of Florida. From no storms in months to three developing in less than twenty four hours. Our dormant time is over. Hurricane season peaks in September and doesn’t end until the end of November. These “pop up” storms in the Gulf of Mexico like Claudette (and Humberto before it) don’t give people much time to evacuate or prepare. Our crews are working almost seven days a week now, trying to keep up. The weather channel is doing a piece this afternoon on Hurricane Katrina. It was generating wind gusts up to 200 mph before landfall! Why? Because it passed over a couple of “warm cores” of circulating warm water near Florida. These warm cores gave it a power boost just before it hit. With global warming generating hotter waters to feed these beasts, we should expect more Katrina size storms in the future – and we need to prepare for them. Do we need an “Ike Dike” on the Texas coast? Or should we leave more wetlands between us and the coast. We probably need both. Galveston needs an Ike Dike since people already live on the edge of the water. Bolivar Island has few people and could provide a “buffer zone” between the storm surges and people. It’s going to be a wild week ahead. It will take more than buying a phone named “Storm” to be prepared (the Verizon Storm is similar to the AT&T Iphone: a big screen touch phone -- I like it). I’m in Dallas at a conference and caught a program on the Weather channel show about “Complacency” – how people stop preparing for a hurricane after being hit, thinking “it won’t happen again.” Then they get hit again – and are surprised. It’s discussed in a book by a Wharton Professor called “War with the Weather.” They are talking about people in Florida but it applies to Texas and other coastal cities as well. How can anyone in a hurricane zone think one hit is all you’ll get? To counter the apathy the Professor said people need to put value on protecting their homes and buildings from these storms. He suggests taking protective measures to avoid future damages -- including getting long term insurance. Julie Rochman talked about the economic logic of “hardening” homes against damage from storms, like" having impact doors and windows that are storm resistant." As if to underscore their words, satellites show that two new tropical depressions have formed off Africa’s coast. One is higher and in a dry air zone, but it is also acting as a running blocker for the second one --which is much bigger in size and low enough in latitude to be in the wet zone needed for it to build up -- and roll into “the slot” into the Gulf of Mexico. We'll see. A Weather lady said it was as if someone had”flipped a switch” and the Atlantic tropical storm season started up, just now. She's right. In Asia, hurricanes are called Typhoons. Right now two of them are racking China and Japan - destroying over 2,000 homes and causing the evacuation of over 1 million people. When I was a kid and read book like "Taipan" about Asian places like Hong Kong, the word Typhoon sounded more terrifying than a hurricane. But the result is the same. Did you know that hurricane/typhoon winds begin to circle counterclockwise north of the equator or clockwise south of the equator? So a Typhoon hitting China (which is north of the equator) is turning the same direction as one hitting the U.S.
And Hurricanes/Typhoons don't cross the equator. Our hurricanes usually start off the coast of Africa (although some have started in the Gulf of Mexico and hit within 24 hours) and the ones hitting China and Japan today started in the middle of the Pacific instead of their usual birthplace off the coast of South America. Hurricanes and Typhoons are called "Cyclones" south of the equator in the Pacific. They are all mother nature's engine to dissipate heat from the hot tropics towards the cooler poles. They are annual events. And global warming can only make them bigger. 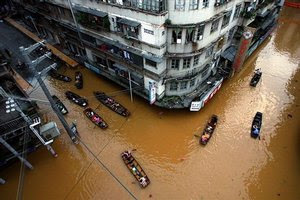 The Typhoons were big enough to send over a half million people fleeing their homes. So if Asia is being pummeled now in the Pacific, sooner or later the Atlantic will release one of its own. Be prepared. September is when all the big storms have hit us - IKE, RITA, KATRINA were all September storms. We are not out of the woods yet for this season. Yesterday we installed our security/hurricane film on a house in Seabrook facing Galveston Bay. The owner told me that he has spent $4,500 on panels that were attached to the outside of the windows with Velcro - it blew away during IKE. Our film cost much less than that to cover his house. Since it is installed on the inside of the glass it is not going to blow off during a storm! Another application that has come up is for obstructing views inside a building - to keep people on the outside from seeing who is on the inside. One potential customer was concerned about a sniper shooting someone inside the building. Our reflective film would provide visual security as well as bomb blast, earthquake and hurricane security. This is an amazing business. I like the fact that we are providing security on several levels with it. Congratulations to Pres. Clinton and those who helped bring these ladies back from North Korea. They, like the group that just got picked up in Iran, need to realize that they made a foolish illegal crossing that was stupid and could easily have turned deadly. They got lucky. But having American hostages held by countries with no judicial standards, countries who choose to be isolated from the international community, isn't a bargaining chip we need. However, on the plus side, this also shows that diplomacy works where invasions won't. One false move and North Korea has the capability of raining 25,000 artillery shells an hour on South Korea's capital, Seoul, home to 20 million people. The South Korean people would pay the highest price if our leadership made the wrong move. North Korea still remains a serious threat to security for more than the U.S. If they are a global nuke dealer to anybody willing to buy then the global insecurity threat increases. Not talking to the North Koreans in the last eight years certainly didn't work anymore than not talking in a marriage makes it work. In fact, not talking to the Koreans gave them eight more years to go ahead and build thousands of new centrifuges to enrich uranium, and that made things more dangerous, not less. Let's hope this incident will lead to renewed engagement with North Korea by the U.S. and our allies to steer North Korea away from threatening its neighbors. The goal should be to engage until both North Korea and Iran select moderate, centrist leadership willing to a positive engagement with the world. Iran's electorate has signaled it wants that kind of leadership. Although it was stolen from them by the conservative Ayatollahs hanging on to power, the undercurrent for change is sweeping over Iran. Perhaps Kim Jung Il's son, the next leader, will also be the change agent needed to open that door his father could not. If Germany and Japan can change from the threats they were in the 40's to the positive world leadership they are today, then North Korea and Iran can do the same. It took the Marshall Plan to make that happen - not punishing them. Did you know that the latest editions of books in the Zimbabwe library are dated 1968? 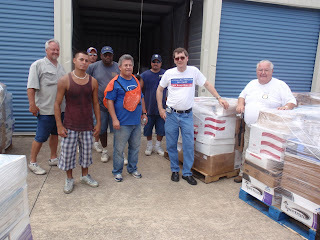 Saturday morning I helped fellow Rotarians and some Community Service volunteers pack 10 pallets of donated school books in Seabrook which will be shipped from Houston to southern Africa, including Zimbabwe. The Zimbabwe librarian told Rotarians at the international convention held recently in England that the latest books they have are dated 1968 – the book covers are held together by tape! Imagine that – 40 year old books! Why not donate some books while you are at it? They even like reading our fiction. 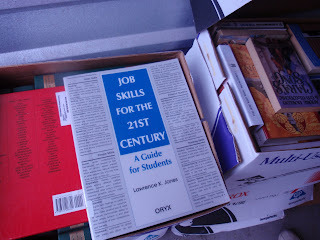 I found one we packed today entitled: “Jobs for the 21st Century.” That should come in handy. Everyone needs to read that one. LOL.